Many of you know that I have recently had many vivid dreams of owning, loving and cuddling on a new hybrid pet. One was a snow white puppy with a scottish fold kitten head, the other was a color-changing cat-snake with Iggy's head and no feet and a desire to cuddle at all times. I saw a puppy name Griffin yesterday that was a beagle German Shep mix and I almost puked in my mouth from the cuteness. 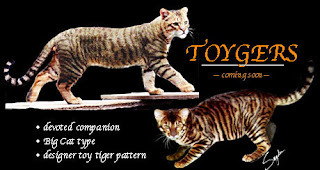 Soooooo, now my dream is coming closer with the toyger! My friend Jamie has always wanted to breed miniature lions, and this comes close. I think Jamie wanted to just get fluffy cats from the shelter and trim them to look like miniature lions and sell them as the lates in designer pets. Toygers- introduced to my thrilled eyes by cute overload. Tomorrow I'm going to Michael's house to cuddle Iggy all afternoon while we watch One Life to Live together. He's my lil toy panther. Favorite narcisist of mine, Tyra Banks, has been increasingly jumping on the curvaceous pride/positive body image bandwagon. I suspect that it is because she has been gaining weight since before she officially retired, and she is prolly sick of starving and/or god knows what she had to do to remain inhumanly thin. I saw her reach melodramatic tears when she announced pridefully that there are two plus-sized models in this cycle's ANTM. God how I hate her acting and am shocked by her audacity, and god help me for how much i just LOVE her. 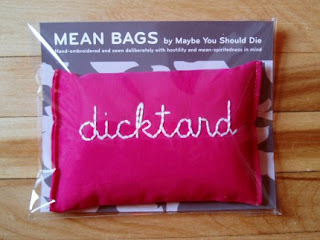 Please, please tell me why!